Gamma irradiation has been used to sterilize synthetic bone grafts but its effect on the biological properties of osseous tissue is not fully elucidated. In this study, OsvehOss synthetic bone grafs were submitted to gamma irradiation doses of 25 and 50 KGy. Various properties such as chemical composition, cell viability (MTT assay), Osteoblast proliferation and alkaline phosphatase activity were studied for the BCP, TCP and HA bone grafts. The results showed gamma irradiation had no effect on the chemical composition of samples. This study showed no significant effect on cell viability and biocompatibility in BCP, TCP and HA samples. The results indicated that no change occurred in alkaline phosphatase activity of samples submitted to gamma irradiation doses of 25 and 50 KGy. Eight different intratunnel tibial soft tissue fixation devices were biomechanically tested in a sheep model. The soft tissue fixation devices included PEEK interference screws (Osveh Asia Medicla Instrument Co., Iran), Metal and Bioabsorbable interference screws. The specimens were subjected to pull to-failure loading (50 mm/min) with a dynamic tensile testing machine. Ultimate failure load (N), pullout stiffness (N/mm), was recorded. The purpose of this study was to investigate the effects of novel synthetic bone graft (OsvehOss™) on experimentally created parietal bone defects in rat’s calvarias. Twenty-four rats were randomized into a 4-week group and an 8-week group. For the calvarial defect model, the dorsal part of the cranium was shaved and a linear incision of approximately 20 mm was opened over the scalp of each animal. The periosteum was removed and four full-thickness calvarial defects were prepared (5 mm in diameter) in the parietal. 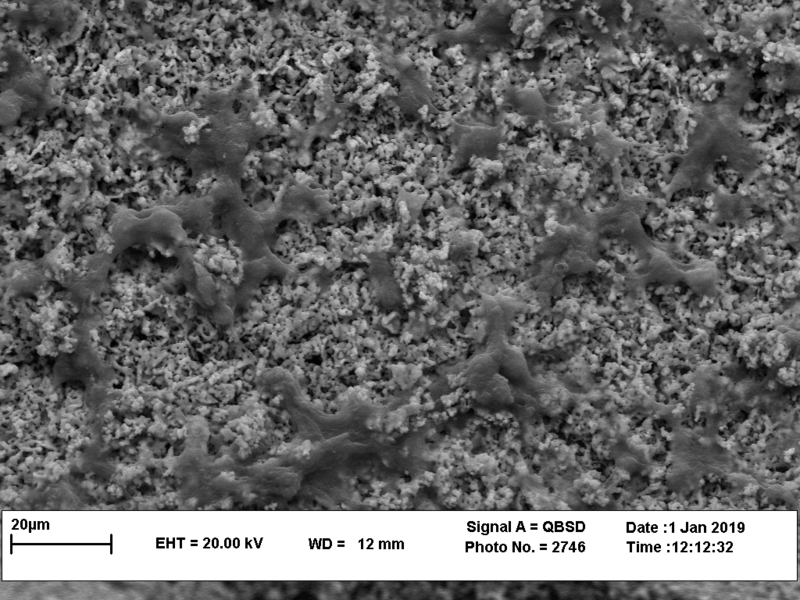 Based on the findings obtained, it could be concluded that the OsvehOss synthetic bone grafts are biocompatible and ossteoconductive and could be proposed as a potential material for filling osseous defects. 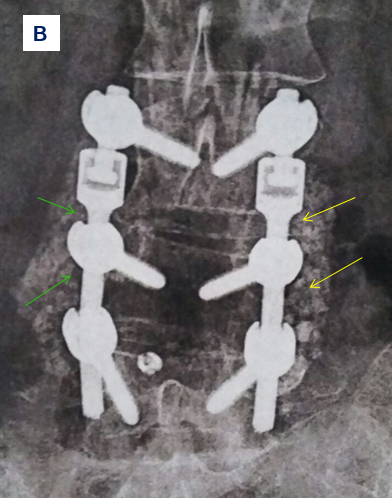 The iliac crest bone grafting (ICBG) technique for lumbar posterolateral fusion surgery is widely used; however, donor site problems such as pain and sensory disturbance have been reported. Local bone is available for fusion surgery, but its reliability as a graft has not been fully reported. In addition, there has been a focus on finding suitable substitutes for autogenous iliac crest bone graft to promote spine fusion. The selection of a specific bone graft substitute can be a daunting task for the surgeon. In current single blind random assigned clinical trial study, we examined instrumented posterolateral fusion with OsvehOss® bone grafts (OBG) versus a french bone grafts (MBG) in a prospective randomized study. 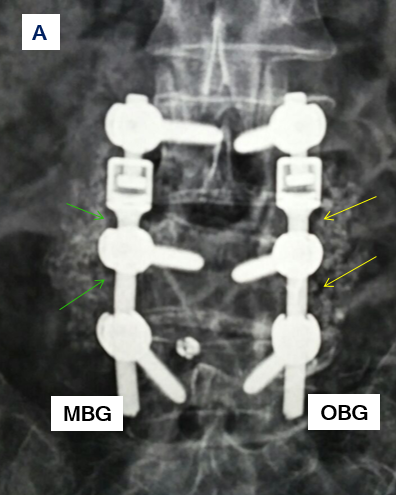 In this research, 19 patients diagnosed with L4-L5 degenerated spondylolisthesis underwent instrumented posterolateral fusion with an OBG (left) and MBG (right). Radiologic fusion and clinical outcome were investigated. Based on Brantigan-Steffee bone fusion classification system scores, the results show no significant differences between OBG and MBG group. Pearson correlation coefficient shows that there is positive correlation between OBG and MBG group in fusion scores. No complications were observed in the OBG and MBG group postoperatively. 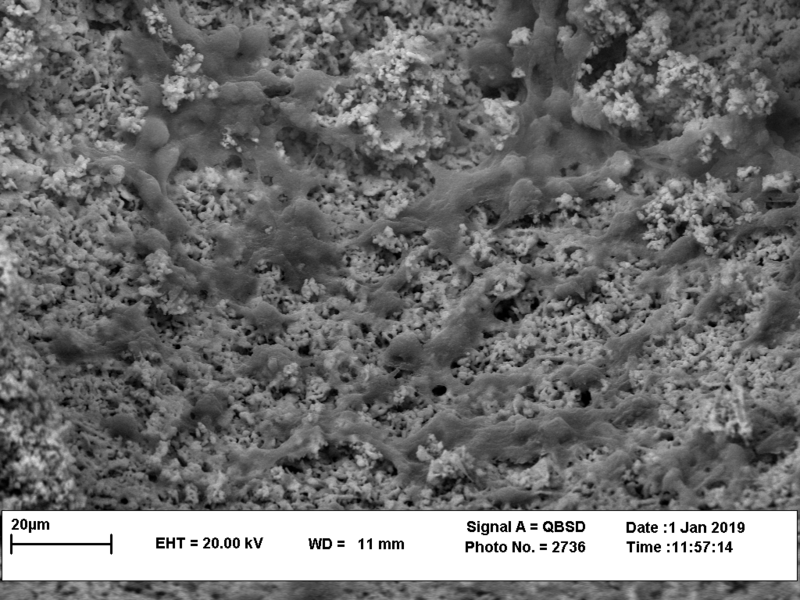 This study showed promising result regarding the efficacy of OsvehOss® synthetic bone grafts with the successful fusion and clinical scores to those of similar structure synthetic bone graft.